USAG YONGSAN, SEOUL - U.S. Army Garrison Yongsan hosted the second Individual Relocation Brief (IRB) May 9 at South Post Chapel, targeting contractors, families and service members preparing to make the move from Seoul to Camp Humphreys. 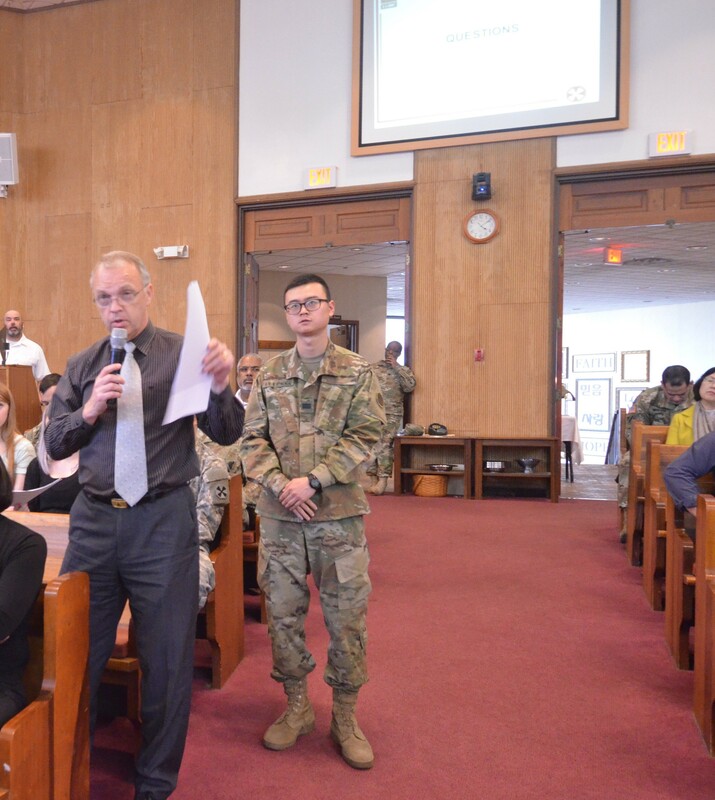 The intent of the second IRB, hosted by Eighth Army, was also to get information out to those who could not make it to the IRB that took place April 11 and to alleviate some of the stresses of moving. 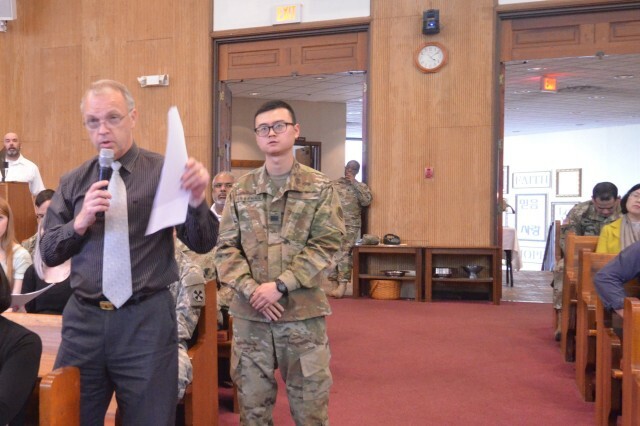 The purpose of this briefing is to provide as much detail as possible on individual relocation efforts, unlike the town halls, said Col. George Shatzer, Eighth Army chief of staff, G5. 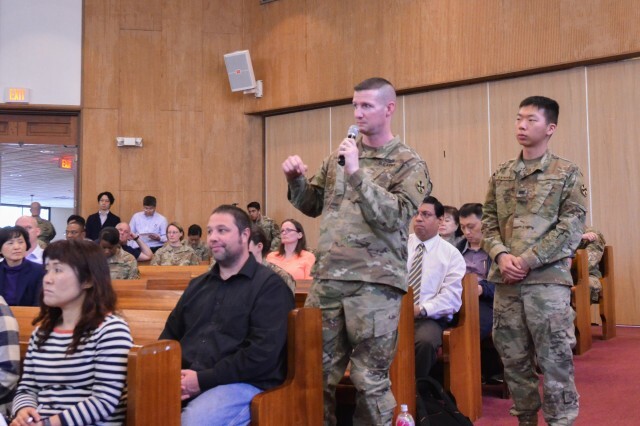 Approximately 80 guests were in attendance for the event according to Kent Garcia, USAG Yongsan transformation and base closure team lead, base closure analyst. Those in attendance were walked through slides that showed by date at what point those making the move should be in their process. 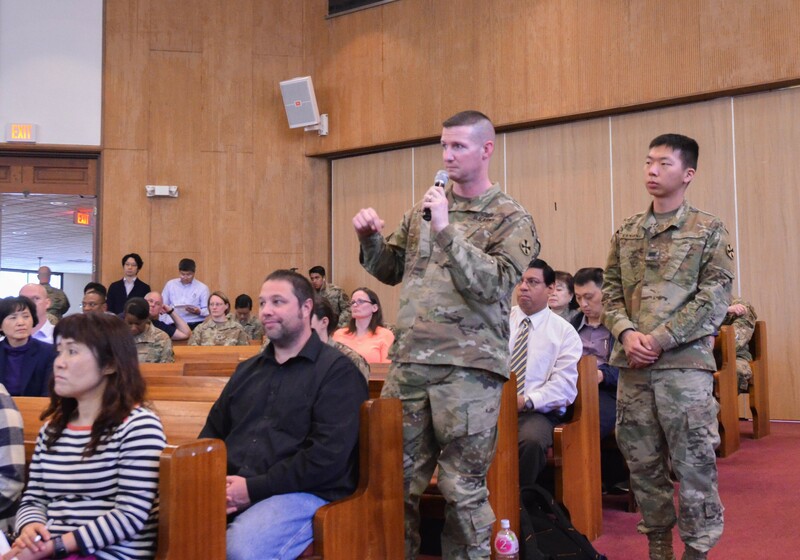 Members of USAG Yongsan directorates further reinforced information on topics such as housing, transportation and finances. They also explained how individuals and families would be out-processed from Yongsan and then welcomed to their new community at Humphreys. To make this transition as smooth as possible, the directorates explained in detail when service members and civilians should schedule household goods pickup and delivery, how financial issues for housing off-post should be addressed, and how to make sure they are adequately prepared when they are finally given orders and their movement date is confirmed. During the brief, families were told how to plan their departure from Yongsan housing and relocation to Humphrey's housing. Those moving can reserve temporary lodging at Yongsan. They should submit exceptions to policy if a second vehicle is needed. At 45 days before leaving, they should notify the housing office to terminate their lease. Families with school age children need to contact Child and Youth Services to transfer their child's information to Humphreys. When those moving reach 30 days prior to their relocation, they can request government leased housing. At 15 days prior to departure, those relocating can acquire permissive temporary duty status and begin house hunting in their new community. When the briefing was complete, time was allowed for those attending to ask questions on specific topics not covered by the directorate representatives. Questions ranged from child care concerns to TRICARE issues and the Central Issuing Facility. The IRB was live-streamed on Twitter and USAG Yongsan's Facebook page and is still currently available for viewing.